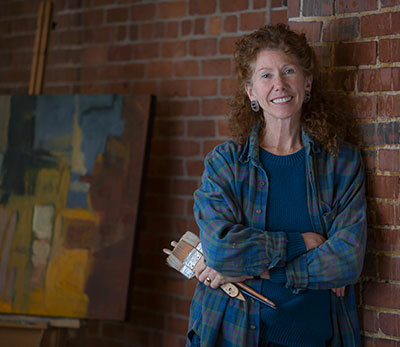 Jan V. Roy began her artistic career as a silk-screen artist in 1979, when she received her first commission from the Portland Symphony Orchestra. For 25 years she designed and printed over 40 posters for various cultural organizations including The Nature Conservancy, The New England Conservatory and the Massachusetts Horticultural Society, for whom she designed an annual poster from 1982 to 2000. Jan's highly successful Brooklyn Bridge Centennial poster crystallized attention on her talent, resulting in one-man shows in Rome, Italy and Paris, France. She also maintained a notecard company, Salt Marsh Graphics. "All of Roy's aesthetic choices are spot-on here ('Lester's Barn'). Her decisions to use the vertical format and to come in close to her subject, so that it fills the entire picture plane, create palpable structural tension that is reinforced by her use of the texture and colors of the acrylic." "The deconstruction of this scene ('Lester's Barn') into innumerable roughly faceted shapes produces an exceedingly large array of colors and tints, some buried deeply and some emerging outward." "With her deft and muscular paint handling and accomplished use of tonal color, Roy renders this landscape ('Greek Village') with tremendous expressiveness and spatial sophistication. The small size of the canvas amplifies the power of the faceted brushwork used to describe the village itself." "Jan's work ('Greek Village') is a combination of surface abstraction and rich landscape, and can be enjoyed for either or both." "This painting ('Eggs') became a pinnacle for my decisions in creating this exhibition. The balanced composition, colors, and shapes created a unique vision and sensibility; evidence that the artist was in control." "This painting ('Maine Harbor'), while recognizable in its imagery, plays with shape and color in a way that imparts the artists' impression of this place rather than a depiction of it. This work sums up much of the issues of contemporary painting practice with artists working between and among disparate kinds of practices and eschewing traditional notions of the medium."